The first suggestion we make is to read what we said last year about the month of Tammuz. What will be said this year will build on what we said last year. Below is the link to last year's Blog about Tammuz. Please press your back button to return to this location after you read last year's Blog. The Torah in Parashat Shelah tells the distressing story of the spies, who were sent to see Eretz Yisrael and then convinced the people that they would be unable to conquer the land. Curiously, the Torah tells us that the spies were sent to Eretz Yisrael during the time of “Bikureh Anabim” – when the grapes began to ripen. This occurs in the summertime, and Hazal indeed tell us that the spies left on the 29th of Sivan, and returned forty days later, on the 8th of Av. The question arises, why is this information significant? How does it add to our understanding of this tragic story? The great Kabbalist Rav Shimshon of Ostropoli, who authored a commentary to the Midrash Pelia, explains that while the Satan always poses a threat to the Jewish People, its power increases during specific times of the year, including the two summer months – Tammuz and Av. Indeed, as we know, many calamities befell the Jewish Nation during these months, such as the destruction of both Bateh Mikdash. The Hebrew word “Anabim” is spelled “Ayin,” “Nun,” “Bet,” “Mem,” and the letters preceding these four letters are “Samech,” “Mem,” “Alef” and “Lamed” – which spell the name by which the Satan is called (“Sama-el”). (In truth, the word “Anabim” is written also with the letter “Yod,” but according to Kabbalistic tradition, the word is written in the “heavenly Torah” without a “Yod”; this subject requires a fuller discussion in a separate context.) On this basis, Rav Shimshon explains, we can understand the Midrash’s remark. The phrase “Bikureh Anabim” may be read to mean, “that which precedes ‘Anabim.’” The Midrash is telling us that this was a time when the Satan is given special power, and thus our evil inclination is particularly strong. Hence, the timing of this expedition is the cause of its failure, as the scouts were especially prone to succumbing to their Yeser Ha’ra (evil inclination). This notion, that the Satan has special power during the summer months, is plainly visible even in our day. The months of Tammuz and Av generally fall during the months of July and August, which we instinctively associate with a “loose” atmosphere, and when we are all especially prone to relaxing our religious standards. This is also the time of year when modest dress becomes a particularly difficult challenge in light of the hot weather and generally laid-back atmosphere. Not coincidentally, our schools and yeshivot close down during these months, and students are left without their ordinary framework of Torah study and outside the Torah environment in which they spend their days throughout the rest of the year. All this proves the accuracy of Rav Shimshon of Astropoli’s depiction of the Satan’s unique strength during Tammuz and Av. Moshe told the spies before they left, “Ve’hithazaktem” – “You shall be strong.” We need to be especially strong and vigilant during this time of year to maintain our religious standards and not relax our commitment to Halacha. Certainly, we are all entitled to a relaxing vacation, which often proves valuable and vitally important for our physical and emotional well being. At the same time, however, especially because of the relaxed, laid-back environment of summer, we need to take extra special care and, as Moshe instructed, to “be strong” in maintaining proper Torah standards. Recognizing the special power given to the Satan during the summer months, let us redouble our efforts to avoid improper behavior and remain faithful to our values even as we enjoy a well-deserved period of relaxation. Tammuz translates as completeness of strength or completely adamant. Tam means complete. Az or Oz means strength or tenacity as in being unwavering in one's power. Tam also translates as simple as in innocent, meaning meandering through life, sitting back and allowing life to go on without much of our participation. Simplicity is incidental. Booze or trap also translates as stubborn. It is also the month when the great flood in Noah's time began to subside and the tops of the highest mountains first became visible. This is a month that commemorates the beginning of the end, the fateful assault on Jerusalem by the Babylonians. This event eventually brought down the first Temple, exiled our prophets in many of our tribes and destroyed the first Jewish Commonwealth about 2600 years ago. It is also believed to be the beginning of the siege around Jerusalem 500 years later that led to the destruction of the second Temple and the second Jewish Commonwealth- this time by the Romans. These claims of events began on the 17th of the Tammuz. In other words, they occurred after the moon had reached its fullness and had begun to wane. This strengthens our connection to tenaciousness and this certainly brings one closer to completeness, to accomplishment. The lesson of Tammuz is about maintaining consistency, not allowing the power you have brought forth to relax, to wane, to slip away by stepping back from its continuance. When we sit back in the simple faith that we've done enough put in enough effort, and our vision or goal will now take on a life of its own and continue to evolve-the walls around us begin to tremble, tumble, and the invasion of failure and downfall meets us instead. Likewise, as a people we grew too comfortable, became overly bureaucratic, excessively structured with monarchs, temples with rituals, and our life force as a nation began to slowly ebb and lose momentum. Our prophets cried to us in the streets, warning us, trying to wake us out of our slumber, but we paid them no mind. Everything was fine the way it was. Simplicity set in, naïveté took us over and eventually callousness. And there we remained with the same tenacious as that which has once given us the strength to become a nation of God wrestlers-the very meaning of Yisrael. And eventually the outside world overtook us and carried us away in chains. The moon of Tammuz is the beginning of the period during which the night begins to borrow from the day-darkness partakes of light, tragedy reaches into the coffers of hope and draws on faith. As bleak as it is in times of having this, Tammuz teaches us to use the darkness to discover the light. In the light the ancient ones reminded us one cannot see what is in the darkness. In the darkness however, one can see into the light. If you are standing in the dark you can easily see what is going on outside of whatever that is lit up; where as if you were in a lit up home looking out your window at night, you would not be able to see what is going on outside. Tammuz is also the moon during which the golden calf was constructed and worshiped. In other words, Tammuz, like its meaning, is a moon that exudes both empowerment and simplicity, tenaciousness and completeness; we can choose to use our strengths, our power, towards completeness, toward purpose, or we can use that tenacity to remain in the state of complacency. We can direct our powers towards building the holy Temple and shattering the golden calf, or building the golden calf and shattering the holy Temple Chas V'Shalom. Tammuz is the month when the sun is at its hottest, the beginning of seasonal shifting from the place of balance. Prior to this moon the days have been as long as the nights. This has been for a while that it is not too hot, not too cold; it is all in balance. With the arrival of Tammuz however, the days become more intense. The days become longer than the nights. In other words, it is a time of shifting away from the place of balance, which in turn can lead to confusion, and vulnerability, both individually and collectively. The ancients reminded us however, that in the very whirlwind of confusion and in this place of imbalance, we can discover the greatest gifts, and claim our highest powers if we but pushed through the impediments. 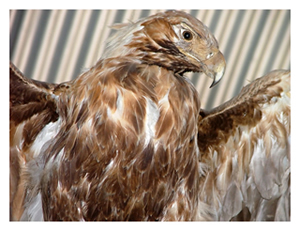 The Eagle, Moses reminds us over 3300 years ago, teaches its chicks to discover their own strength and capacity by stirring the nest so that they fall out. And while falling toward their possibly tragic deaths, they flap their wings desperately and in their struggle discover excitedly they can fly. In their greatest moment of vulnerability and weakness, they discover their power and independence. During Tammuz, the ancients taught, God calls out in a resounding, vibrational sound that is inaudible to mortals, a sound that summons the deepest recesses of our powers. This divine call delivers courage to those parts of us that are afraid-even to those animals that live in fear of predators-call for courage and stamina. Like Rabbi Nachman of Breslov teaches: Within the very obstacles that prevent you from discovering God, is precisely where God waits to be discovered. Tammuz is an incredible challenge, and equally an incredible opportunity. Attribute: Vision ראיה - Re'Ehyah to appreciate the gift of what comes to us and not be intimidated by it. To become a true seeker of spirituality, someone who will open the door to the spiritual worlds, we need clarity of vision, the capacity to see beyond the way in which we are accustomed to seeing-to see beyond the way something appears to be, to look deeper into the literal experience to discover the mystery that it conceals. That way we do not lose faith or hope in the face of that which seeks to intimidate us, to block us. We will then be able to clear the whirlwind swords of fire being waved in front of us by the Cherubs as we strive to make our way back to the Tree of Life. After all, balance is the path to the Tree of Life. The word Cherub comes from the root that is rooted in the word for closeness, nearness, approachability the very things that seem to keep us distant are the very things that at the same time dare us to approach. Ancient Tribal Connection: Yehudah יהודה The tribal archetype for Tammuz is Yehudah which means appreciating what God brings us whether trials or gifts. Both are welcome. Of course we usually appreciate the gifts rather than the trials. Learning to be certain that both come from HaShem is a tremendous growth in spiritual consciousness. This is the essence of the meaning behind Judaism. It is about always being grateful even for what we don't yet understand-an appreciation born out of certainty trust and faith. Judah's mother Leah is unhappy about her husband's lack of appreciation of her, his attention being mostly focused on her sister Rachel. She names her first three sons based on her agony, but when she gives birth to her fourth son Yehudah, she exclaims this time, "I simply thank God." She has pushed through the obstacles to claim her own power, and discovered joy within herself as opposed to seeking it elsewhere or hoping it would come from someone else. Yehudah is not only elected to lead his brothers, including the three that are older than him. He is also designated as the ancestral lineage carrier of the Messiah. He is fierce like a lion, yet humble in his demeanor. When he errs, he is not afraid of openly admitting his guilt, a trait that trickles down through the ages to his descendant David, who confesses and owns responsibility for his illicit union with Bat Shevah and his involvement in the demise of her husband Uriah. Yehudah then, is an archetype that combines ferocity, honesty and humility. Modern Tribal Connection: Reuven or Reuben רובן Leah explained, upon seeing her first born, "See, A son." This is the meaning of the Tribe of Reuben. This is why the Kabbalists teach us that the "missing" tribe of Reuben is somewhere in China. The Chinese have a significant bias towards male children as a cultural inheritance. There is much to learn from the Tribe of Reuven as indicated in the section below the Ancient Wisdom Sections. Tribal Totem: Aryeh or Lion - אריה The totem of the tribe of Yehudah and the moon of Tammuz is Lion. Its basic quality is warrior, with the wisdom to know when to use one's full power and when to hold back from using one's full power. The lion, like the divine light, walks in balance between the extremes, between fierceness and being overpowering. This is why in Hebrew we call lion Aryeh which is two words OHR meaning light and Yah which meaning God. Thus, the translation is the God of light. The God light, like the lion is both fierce and overpowering as well as healing and nurturing, depending on what is called for in the circumstance in the moment. The lion is also the sacred keeper of the East, the place of new beginnings, the very same direction whose charge was assigned the tribe Yehudah during the desert journey. East in Hebrew is Mizrach which implies shining, as East is where the sun begins to shine across the planet. It is also called Kedem which implies beginning. New beginnings always required us to ring forth our deepest warrior instincts. New beginnings are often intimidating, scary, exciting, fun, all at the same time. 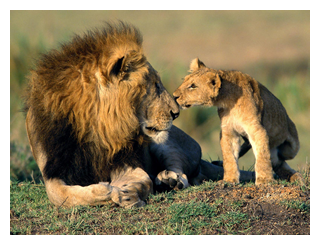 The lion is also patient and playful, frolicking with young cubs and enduring impatiently their playful swipes and climbing. But when threatened, or needing to hunt prey to sustain the family, the lion shifts to become the warrior. The completed Warrior is the one who is fierce in the battlefield and a gentle kitten at home. Tribal Stone: Emerald נפך BoRecket The stone associated with Tammuz and also the tribe of Judah is Nofach which translates as turquoise, whose quality is strength and victory in times of struggle, related to the word path which means a burning ember. It is about endurance, keeping the inner fire burning, and the passion to overcome, to see things through to its climax, to its ultimate realization. The herb associated with Tammuz is frankincense which lives on almost everything. In its original state frankincense seems to be in a state of potentiality. It is the dream before it is realized. It is all the colors before they are manifested, before they are individuated. It is like the ray of sun that is light white color which is then translated by the mist of rainfall into many different colors, individuated. Frankincense reminds us that everything is one but not the same. It carries the power of individuation, of bringing forth the unity of diversity, and the diverse list of unity in the blood. In the blend of the sacred incense offering it is the blending of elements, magically blending all the qualities of all the other plants into a singular mix where a single aroma is created, a single stream of smoke, yet without overwriting the individual quality of each plant. Paradoxical, or magical? Or both? The house associated with Tammuz is Beit HaAvot which is the house of the ancestors. To live in the house of the ancestors demands that we rise to the occasion of becoming ancestors ourselves not only living in the shadows of those came before us, but also becoming the shadows for those who will come after us. Living in the house of ancestors requires us to take stock of ourselves, keep trying, not be overridden by our failures, but to focus on and build upon our achievements, our talents, our unique selves. All of our ancestors the Torah shows us had their moments of failure, of falling, but never did they allow those follies to stop them dead in their tracks. They moved on. They moved through it all. They got up and thereby became ancestors, models, exemplifying to us how to walk through blizzards, traverse storms, and rise up like the Phoenix from out of the ashes, again and again. The shadow moon for Tammuz is to Tevet whose house is the house of sovereignty which is about control, wielding one's presence and power over others. This is the challenge to the visionary, to the archetype of the lion, the lawyer-to know when to pull back so as not to overwhelm others with their power and clarity. Because being a lawyer means also to know when to be silent even when one has more clarity about a situation than others and to know when to step back and allow others to figure things out, make their mistakes, or hopefully, shine, and discover their own powers and greatness. 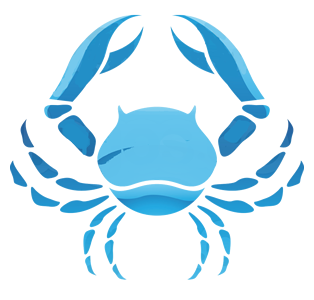 Zodiac Sign: Sartan/Crab סרטן This is the drama of our emerging from mother water to find our own balance, our own independence, our own selfhood. The crab moves from sea to land, from the womb of newness to the daring adventure of engaging newness, leaving the sea for dry land, and dry land for the sea, transitioning interchangeably from spirituality to physicality. The crab then reminds us of the oneness of both and the equal need and importance of both in our lives. Water represents spirituality; Earth represents physicality. Crab teaches us the sanctity of merging the two realities into our everyday lives, spirit and matter, body and soul, and not to live exclusively in one or the other but in both at the same time. Judaism brings this important lesson home to us through our rituals, including our seasonal celebrations, all of which are spiritual in intention and physical in implementation. For example, we celebrate Sukkot with special sacred rights, but also with special feasting and physical joy, as it is written in the Torah, "and you shall rejoice in your seasonal rights to be happy." The positive side of the Crab is expressed above. The negative side is the Crab is constantly reacting to his fears and staying at home. Also, the Crab can not walk straight ahead but must move to the side. This is the nature of the human crab also. Tribal Direction: East קדם Shining as this is where the sun begins its journey and brightens up the sky. While we do not read Korach during the month of Tammuz i left the information available to read from this blog since the ideas of the natural disasters being controlled by man is important to learn and utilize in our lives. Also, since the 3 negative weeks start in Tammuz and we are warned to stay away from natural bodies of water which relate to the formation of many natural disasters like Tsunami and Hurricanes and the like. Parasha Korach - This essence allows us to control earthquakes and other natural disasters. Here are links to understand this more fully. Parasha Chukat - Removing Death and using the tool of Mind Over Matter. Parasha Balak- The vaccine against Uncertainty or Elevating your connection to Certainty and removing Doubts. Another name for this is Warring Against Amalek. 5774 we are adding the concept of the Vaccine against Evil Eye and Evil Speech. Parasha Matot-Masei- Journeying through the Universes. Each Parasha relates to the energy of Tammuz and by recognizing these Parashiot and its relationship to the Month will enhance your ability to control the energy on Rosh Chodesh. The essence of this month is expressed in its Name. Tammuz has no direct meaning because it is composed of the Shoresh (root) Tam spelled תם and the two letters Vav (ו) and Zion (ז). Tam means completion. It also means innocent, simple, naive, and harmless. We will discuss how each of these terms impacts the energy of Tammuz in the next few paragraphs. The Vav and the Zion are the letters that created the Astrological sign of Taurus and Gemini. These are the previous two Hebrew months. They also represent the majority of the period of the Omer, which if we remember is a period of Tikune or Rectification of personality traits. The gematria of the Vav = 6; the gematria of the Zion = 7. Together the total is 13 which is the gematria of the word Echad. Echad means one or unity. One way of understanding the energy of Tammuz is we have the potential to complete the unification. To what unification are we referring? Let's see below! We need to also realize that the letter Chet is formed from a Vav and a Zion by the Scribe when writing a Torah Scroll. The Chet is a letter that is cognate to the Hebrew word for Sin. The Chet is formed when the Scribe adds a carrot house above the two letters connecting the Zion to the Vav. The completion of the Vav and Zion is created when all of the sins/mistakes are corrected through Teshuvah. The months of the Hebrew year are connected to the Tetragrammaton. The Kabbalists teach that Tammuz connected to the upper Hey. In Kabbalah the upper Hey represents Binah also called Emma or Mother. The Mother gives birth to all of the six attributes of Zeir Anpin. She represents the seed level for these six attributes. The Kabbalists teach that these attributes are the emotive passions or emotions. This is the essence of the month of Tammuz. It is the unification of the Yood and the Hey which spell the Name Yah. The external aspect of our mothers is Mother Love - Love for her children. That is the nature of the month of Tammuz, unifying our mind and body by controlling our emotions. Emotions are the hardest thing to control. They are the root of our reactive natures. When we learn to control our emotions, we achieve complete unification of all of the worlds. That is the opportunity during this month of Tammuz. When we control our character traits as we worked upon during the Omer period, we essentially learn to control our emotions. The Tetragrammaton permutation comes from the last letters of four words in the Scroll of Esther Chapter 5 Verse 13. Here are the four words זה איננו שוה לי . The word for word translation is "this;" "our nothing;" "to be like;" "to me." The fact that this permutation is coming from the last letters of these words indicate that the month of Tammuz is within the frame of judgment. Now let's look at the permutation of the Tetragrammaton for the month of Tammuz and what we can learn. The Tetragrammaton is normally spelled יהוה. When the Yood is in the first position- the first position is normally considered the World of Atzilut (Emanation). The second position normally has a Hey and is considered the world of Brea (Creation). The third position normally has a Vav and is considered the World of Yetzirah (Formation). The fourth position normally has a Hey and is considered the world of Assiya (Action or Manifestation). This normal permutation which is used in the month of Nissan puts the Name of God in its normal, proper, and optimal placement to provide for the maximum flow of the Beneficence of HaShem. In essence, the Yood in the World of Atzilut allows for a concentrated point of connection to the World of Ain Sof or Endless World. The upper Hey in Beria expands to support actual Birthing and Creation. The Vav then channels this energy of Creation into the final Hey in the World of Malchut which is Manifestation. When we look at the permutation for Tammuz, we see the Tetragrammaton is in exact reverse of the normal order. Instead of the Yood being the point to draw from the Ain Sof, we have a larger vessel which may bring too much energy. The Vav in the second position now channels this additional energy to the Hey in the third position, which may find itself too small for this much energy. Finally, the Yood in the Malchut position is ill prepared to manifest this energy. In essence the month of Tammuz is not a good time to be doing. It is a month of feeling. It is month better suited to learning to control our out of control passions and emotions. The letter Chet is also a word that can be spelled Chet Yood Tav. It is cognate to the Hebrew word for "missing the mark" or "sin" (please do not think of this as the western civilization's understanding of the word sin). The Chet created the constellation Sartan in Hebrew (סרטן). 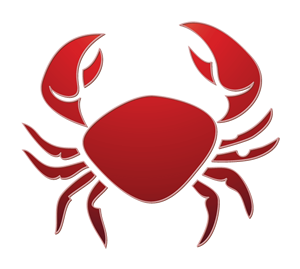 This word is translated as both a crab and the astrological sign called cancer-including a disease called cancer. Make no mistake; there is a very direct relationship between the sign of cancer and the disease of cancer. The Kabbalists teach that all effects of the disease start during the month of cancer. They may be too small for our modern technology (X-Rays, Cat Scan, MRI and the like) to see it; yet all tumors begin during this month. The Kabbalists also give us a simple tool to avoid this manifestation of the disease during this month. The Kabbalists tell us to be happy no matter what we are feeling. (This is the beginning of controlling our emotions). You feel reactive and angry...Be Happy; You feel sad and alone...Be Happy. This is a simple tool yet not a tool that is easy to manifest, and that is why we have this plague called cancer in our generation. The major Tikune for all of us is to remove Hatred (an emotion) for no reason. When we decide to be happy and then manifest happiness during this month we are going against our selfish desire to receive. Please be happy during this month. The Tav is the letter that created the moon. The moon is a metaphor for female since visually the moon goes through cycles. New moon, first phase, full moon, last phase and returns to a new moon. The Light does not change. The vessel is constantly changing as it strives to get closer (meaning more like the Light) to the Light. This is the root cause of the connection to emotion during this month of Cancer. Here is a very important tool to help you modify your emotion and remain Happy during the month of Tammuz. Cancer is a code word for Desire to Receive for Oneself Alone. Since we know that the disease is manifesting during this month as a demonstration of our selfish desire, all we have to do is remember to remain happy no matter what we feel like and there can be no disease manifesting in our life. Also, the Tetragrammaton being in reverse order makes it easier to REVERSE OUR EMOTIONS BACK to HAPPINESS. Together the two letters Chet and Tav have a Gematria of 408. Other words with this gematria demonstrate the relation to cycles and emotions. Chait spelled Chet Tav means fear or dread along with terrified or broken. The word Ahavat (gematria 408) means love. SheChek (also with gematria 408) means laughter and joy. Nechasim (gematria of 408) means snakes as well as sorcery. When we transform the Snake into a positive helper we are transforming Hate (the essence of the Snake) into Love. As one can see all of the words with this gematria presented here are dealing with emotions both positive and negative. This is why the month of Tammuz has two aspects, its positive aspect from Rosh Chodesh through the 16th, and its negative aspect from the 17th (Tov or good in its reversed form) through the end of the month. There is one other word that has a gematria of 408 that reveals the positive aspect of Tammuz. It is the word Zot spelled Zion Aleph Tav. The meaning of this word is This. We say/sing this word when we remove the Torah from the Ark on Shabbat Morning (Zot HaTorah). The Kabbalists teach us that the letter Zion in Zot represents Zeir Anpin or the Spiritual World and the letters Aleph and Tav represent all of the energy of the Hebrew Alef Bet which is a metaphor for all of the endless vessel, culminating in the physical world. Zot therefore means a unity between the spiritual and physical worlds. This is why the 17th of Tammuz was intended to manifest the end of death in our world, but due to the Golden Calf we got this wrong one more time. Yet the universe promises us another opportunity. Are you getting ready for this event? It is called the "Coming of Mashiach!" The only Holiday in Tammuz is the 17th day. Had there not been a Golden Calf incident this would have been the day that Mashiach would have manifested in the world. Moshe would have revealed himself as the Mashiach according to the Sages and Death would have been swallowed up forever. What a Happy Day. This energy is still available to us. That is potentially why it is a day of fasting that commences the most negative three weeks of the year. These are the three weeks from the 17th of Tammuz to the 9th of Av culminating in the Holiday of Tisha B'Av. The Jewish World fasts on the 17th day of Tammuz as a sign of mourning while the Kabbalists fast on the 17th day of Tammuz as a way of elevating so that they can connect to the energy of Mashiach. We recommend that you remain happy during this fast so as to connect to Mashiach. Here is the link to the Meditation for an Easy Fast, please use it any time you fast. Rabbi Isaac Luria has given us a very important meditation so that we can handle the energy in the universe during these three weeks. Here is the link to the 3 Weeks Meditation, please use it at least once per day (3 times daily is recommended) during these three weeks. The energy days of Tammuz are Rosh Chodesh which this year has two days of Rosh Chodesh and the 17th day of Tammuz. There are also many very high souls and Tzadikim who left during the month of Tammuz for the sole purpose of helping us during this difficult period. It is extremely helpful to mention their Name on the Day of their Hilulah. Here is the link to the Tzadikim from Tammuz. Here are the connections to the Tribe for the month and the Leader of that Tribe from our website, with information about the Nasi and the attributes dealing with this month. I suggest you spend some time during this month checking out the attributes of the name Reuben and the Name of the Nasi who gave the dedication and his consciousness of why he gave what he gave. Remember not all of these attributes are positive and with the tool of "Binding by Striking" we can correct them and transform them into positive aspects. Here are strategies to adopt for this month of Tammuz that will help keep you in control of your emotions. Yet Remember the most effective tool to keep you in emotional control is Binding by Striking especially step one, STOPPING YOUR REACTION. 1. Act Consciously: Whenever something happens that we experience we are reactive. If we stop this reaction, we are bringing our unconscious selfish reaction to the level of our consciousness. This is what is meant by "act consciously." Think before you act. During this month we will be exposed to deep intense and varying feelings and emotions. We need to learn the unconscious motivation behind these emotions. This is a month to control our feelings not a time to re-act. 2. This is a month to strengthen our Hitbodeduth (translated usually as meditation, yet it also has the meaning of "retreat within oneself"). The universe is supporting our internal investigation into our emotional motivations. Use this energy to retreat into yourself. Use the words of the Sages and the Tanach to promote this "retreat." 3. Stay at Home: The universe supports the idea of staying home rather than going out traveling during this period. In fact, the Kabbalists tell us to stay away from natural bodies of water. The reason behind this has to do with the energy of the month. Tammuz is a time of judgment. Water is a channel for the energy of Chesed. The negative system would like nothing better than to use water to manifest judgment. This corrupts the effect of water in the world. This actually occurred during Noah's Flood. This is why it is important to say a Blessing prior to drinking water as the Blessing reverts the water to its essence prior to the corruption caused by the Flood. There is also a process of returning water to its pre-flood state given to us by the Kabbalists. Unfortunately this has not yet been translated into English. The crab is a shellfish that is not capable of moving directly forward. During this month the energy will tend to push us to not be straight forward in our dealings. This can come from our fears. Like the child who is afraid to admit he did something wrong and tells a lie even when he knows the lie will be discovered. The crab also is covered with a hard shell. It protects itself by withdrawing into its shell so that the other fishes can not access the crab itself. It is very vulnerable when it loses it shell. Since the shell is hard there is no room to grow. The crab loses its shell as it grows. When this happens the crab has to find a place to hide. The crab hides in caves and under rocks. We hide in our homes. This is a month of growth and if one does not have the shell one becomes very vulnerable. This is the reason we recommend staying home since the energy of the month does not support exposing our vulnerabilities through actions but evaluating and changing ourselves to remove these vulnerabilities. 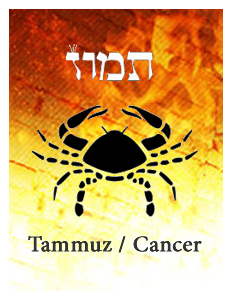 If your lunar north node is in the Zodiac sign of Cancer or Crab, your Tikune is in Sartan or Cancer in Hebrew. The person with a tikune in Cancer carries an enormous amount of pride left over from a previous incarnation as a Capricorn. As a Capricorn, you were totally obsessed with professional victory, honor, and respectability. Bolstering your own reputation was the main motivation of your life. You undertook impossible tasks, if only to gain the admiration of others. You appointed yourself judge and jury and, as a consequence, condemned the mistakes committed by others. Though you saw yourself as a guardian of the moral order, you neglected morality’s most important attribute—mercy. As a result, you have not forged many friendships and have often been considered a shameless opportunist. This drive to achieve overwhelmed you with excessive responsibilities that prevented you from thinking of others. Consumed by social missions, you were, oddly enough, oblivious to other people. You lived cut off from the real pleasures of life—home, family, friendship—and lived a secluded, selfish existence in your own secret universe. From this previous incarnation, you have the seriousness and discipline to accomplish whatever goals you set for yourself in this life. But the tikune in Cancer suggests that you relinquish the notion that professional victories, social importance, and your own reputation are the keys to your happiness. Kabbalistic wisdom tells us that these are all illusions. Your correction in Cancer points you toward a new goal. It suggests that real happiness—durable, satisfying happiness—can be found in the creation of a truly warm and loving home. Along this path, you will discover a world heretofore unknown to you is filled with the wonder, simplicity, and spontaneity of childhood. You will learn flexibility and generosity in relationships and parenthood. The most difficult renunciation of your past life will lie in your abandonment of the well-established Capricorn ideas of success and failure. The key to your real success will be found in the loving eyes of your family and in your dedication and devotion to that love. It is here that you will find the ultimate satisfaction. During Tammuz we all will be exposed to deep changing emotions. Summer starts during Tammuz and our life patterns and habits change from our normal school year patterns. This causes us to become reactive to the new patterns. Try not to travel during this period. Try to not allow yourself to become reactive. Try to stop your reactions during this period. Use the energy of healing from Iyar and the energy of balance from Sivan to achieve the completion of unification of our homes and families during the month of Tammuz.